I sort of let this month’s Full Moon slip past me. I noticed it was pretty big on the Third of July, but I figured everybody had plans for the weekend and I let it go. Hilary Carmichael, my former chief lab technician posted the picture above to her Facebook profile, along with some others of the spectacular sunset that night and some more ohhh and ahhhh fireworks shots. That got me to recalling that I HAD ridden the Lake Okeechobee Scenic Trail one Fourth of July night. 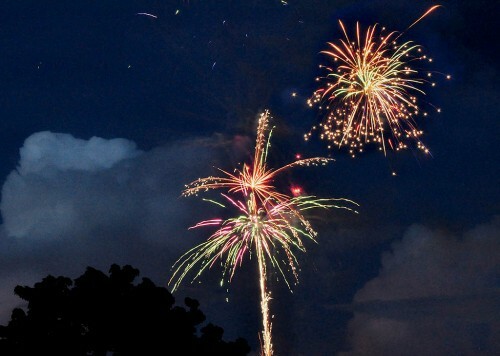 From high atop the dike, you could see fireworks from all around the lake. Next year, Full Moon or not, I’m headed out to get LOST on the 4th. Next PostNext Blackburn Pump Goes Pow! !